Overview of methodology used for single B-cell antibody gene isolation and recombinant antibody production. The binding of an antigen to a specific antigen receptor of a B cell triggers the B cell to activate and differentiate into an antibody-secreting, known as a memory B cell. Genes in the B cell encoding the Ig variable region undergo somatic hyper mutation followed by selection, leading to increased binding strength between antibody and antigen. There is now a method to extract memory B cells specific for an antigen from the peripheral blood of individuals and then produce this antibody. AbET uses the FACS within the Flow Cytometry Core to sort single cells which produce antibodies to the antigen of interest. Then AbET synthesizes cDNA for one or more antibody variable regions (VH and/or VL) with a primer (or primers) complementary to sequence(s) within the constant region. The cDNA is used as template for PCR amplification with gene or gene family specific primers. The purified PCR products are sequenced directly and aligned to V region germline database. 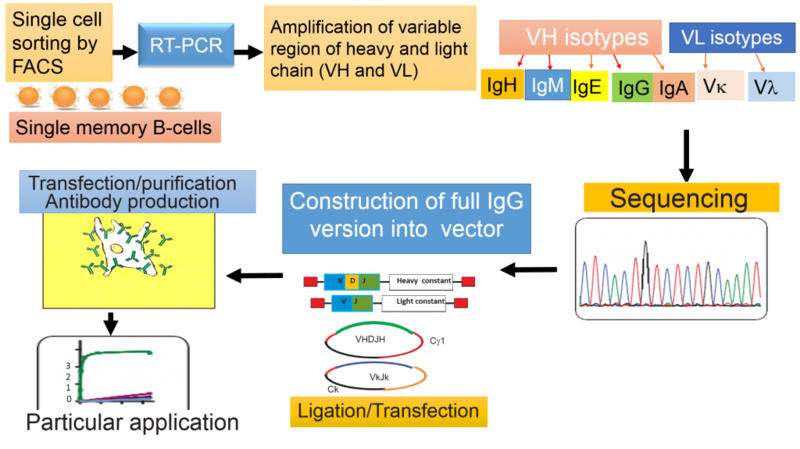 The antibody variable region of heavy chain (VH) and light chain (VL) genes are cloned into expression vectors in a wide range of antibody formats. The recombinant antibodies are expressed in mammalian or E. coli hosts. 1 x 105 cells per single cell sorted PBMC are sufficient for cloning and sequencing memory B-cell antibody genes.